"There are no good men in Ketterdam. The climate simply doesn't agree with them." "He had often wondered how people survived this city, but it was possible Ketterdam would not survive Kaz Brekker." As soon as I finished Six of Crows, I had to get my hands on this book as soon as I could. So I downloaded it to my kindle instead of waiting patiently for the free copy I could borrow from my library. Oh well, haha. The book picks up where the action left off in Book of Crows, and you're immediately thrown into the midst of the story. The plot was engaging and definitely page-turning, but there were segments where I felt bogged down by all the details in Kaz' scheming, if that makes any sense. I just feel like it was a little difficult to follow, but in the end, it all came together. As Kaz tells Wylan, "I control the game . . . or I don't play." As in Six of Crows, this book's real strength is in the character development. 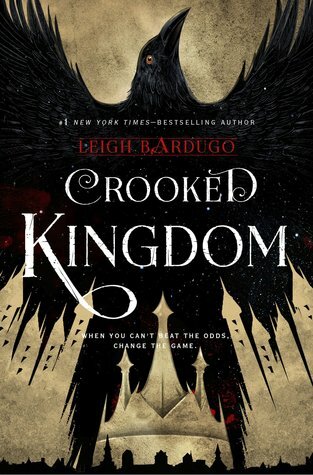 In Crooked Kingdom, each character's personal demons and struggles bring them to a breaking point where they must decide. Will they choose the harder, better path? I loved watching each of the six (Kaz, Inej, Wylan, Jesper, Matthias, and Nina) go through that process of realization and self-sacrifice in order to ultimately reach redemption and reconciliation, both with themselves and with others. You have to learn to accept and embrace yourself, before you can love someone else. Leigh Bardugo artfully crafts the tension between Inej and Kaz throughout the story, and though it's so frustrating as a reader, it's done so well that as a writer, I can't help but admire her. I'm not going to give any spoilers, but I loved watching the relationship between these two characters shift and develop. Relationships are messy, because people are messy, and I thought this could really be seen with these two. I highly recommend the Six of Crows and Crooked Kingdom duology. The characters are so dynamic and fresh (not overused cliche characters that sadly overpopulate much of YA literature), and watching them develop from the beginning of the series is so enjoyable. And the ending, though bittersweet, is just perfect. I won't say anything more about it, but I wasn't disappointed. Thank you, Leigh, for giving me a series to rave about in YA lit again!